Reliability and repeatability are key requirements in performance benchmarking ensuring the trustworthiness of the obtained performance results. To apply a benchmark to multiple systems, the reusability of the load driver is essential. While Faban has been designed to ensure the reliability of the performance data obtained from a benchmark experiment, it lacks support for ensuring that the system under test is deployed in a known configuration. This is what Docker, a recently emerging containerization technology, excels at. 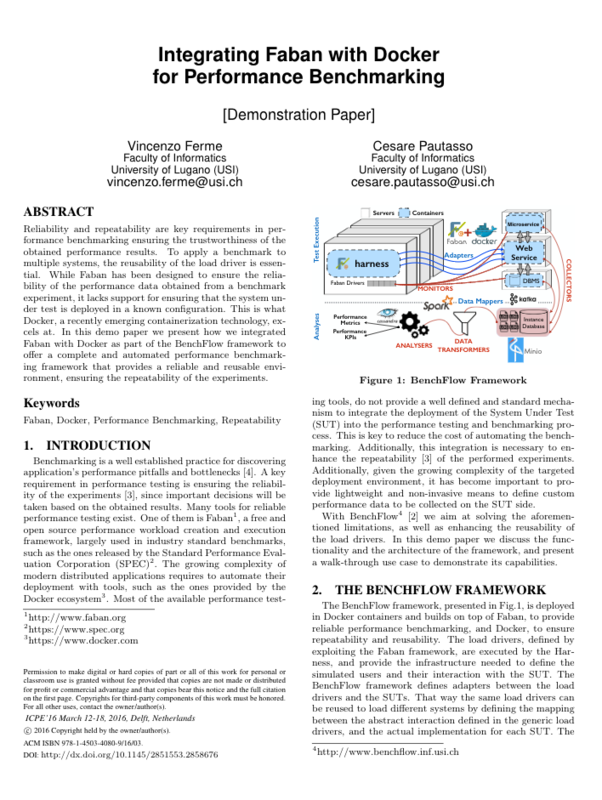 In this demo paper we present how we integrated Faban with Docker as part of the BenchFlow framework to offer a complete and automated performance benchmarking framework that provides a reliable and reusable environment, ensuring the repeatability of the experiments.